Charge Shot!!! 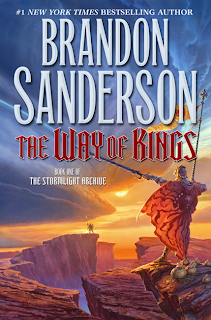 : Book Review: Brandon Sanderson - "The Way of Kings"
Brandon Sanderson - "The Way of Kings"
When Brandon Sanderson was selected by Robert Jordan's estate to complete the epic Wheel of Time series in 2006, his career quickly heated from a slow simmer to a boil. Long-time fans of the series (of which I consider myself one) were apprehensive that this relative unknown was picked to finish one of the more ambitious fantasy sagas of the last two decades. However, with the publication of The Gathering Storm in 2009, and last year's Towers of Midnight, Sanderson has proven both a capable storyteller and a fitting figure to keep track of the arcane and encyclopedic minutiae of the Wheel of Time universe. With the series set to end next year, however, it's clear that Sanderson doesn't want to be known primarily as the guy who finished somebody else's story. 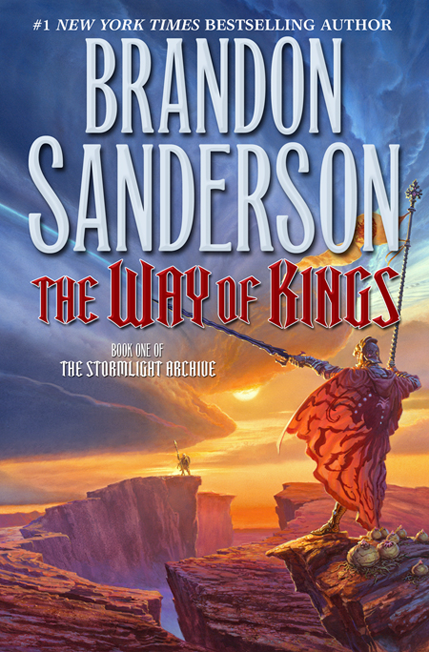 In a fit of workaholicism, 2010 saw not only the publication of the 800-some pages of Towers of Midnight, but also Sanderson's thousand page original story, The Way of Kings. Jordan's Wheel of Time is rather infamous for its epic length, but Sanderson apparently wants to follow in his predecessor's footsteps. The Way of Kings is the first book in The Stormlight Archive, a projected ten (!) book series that Sanderson has been planning for several years. Now that Sanderson has made a name for himself in the pool of epic fantasy literature, Tor Publishing seems to be setting him up to be the Next Big Epic Fantasy Writer on their payroll. The book's hefty weight, as well as it's beautifully drawn maps and illustrations, support the notion that this is meant to be Sanderson's magnum opus (or at least the first tenth of it). Sanderson comes from the Robert Jordan School of Fantasy in one other important aspect - in addition to a desire to push the number of volumes in a saga to double digits, he is also dedicated to the genre's traditional tropes. While writers George R.R. Martin and R. Scott Bakker have been making waves writing fantasy awash with moral relativism and subverting the "honorable, courageous protagonist" figure, Sanderson's fantasy is much more old-fashioned. The good guys are courageous and honorable, though not without a moral crisis occasionally thrown into the mix, and many of the bad guys sneer and smirk as often as you'd expect an evil villain to do. Those looking for a deconstruction of the genre should go elsewhere. That's not to say that Sanderson is unoriginal, however. Like The Wheel of Time, The Way of Kings manages to take some well-known archetypes and cloak them in interesting new garb. The entire story is set in a world racked by magical storms that have ravished the landscape; the flora and fauna have evolved to adapt to the heavy rains, the cities are built in the few spots of geological safety, and even the currency revolves around gems that are illuminated by the magic of the rains. Sanderson makes references to many fascinating aspects of the world, and I was more than willing to read a thousand pages about this place. But the characters, unfortunately, do not match the care taken into developing the setting. The main protagonist, Kaladin, is a young surgeon-turned-soldier-turned-slave, who is faced with inspiring his fellow slaves to escape. The central female is Shallan, a young student who has come to study under a famous scholar, but with the motivation of stealing the scholar's magical items to save her family's estates. In the background of all this is a senseless war going on amid the Shattered Plains, a series of ravines and plateaus that has had the opposing armies antagonizing each other for ten years, with little change of position. It reads a lot like medieval trench warfare. Admittedly, this is all a pretty interesting set-up, and for the first two hundred pages or so I was willing to give Sanderson time to put all the pieces into place. After all, this is going to be a ten-book series, right? Unfortunately, by the end of the book, the pieces were still not quite in a position for anything to actually happen. Both Kaladin and Shallan's plotlines inch forward at an incremental rate, and I found very little plot progression at the conclusion of the book. What appears as an interesting set-up turns out, in fact, to be the whole plot. This is disappointing because, as I said, the world itself is fascinating. The warfare of the Shattered Plains, where armies are forced to carry massive "bridges" to forge their way across the broken mesas, is both original and well-written, and Sanderson also manages to paint a fascinating history to his universe, revealed in pieces as Shallan continues her academic studies. The final epilogue of the book reveals several hints of interesting things about to happen but, alas, then Volume I ends and Volume II is not projected to appear until 2012 or 2013. Unfortunately, the setting isn't enough to support the massive book through a lethargic plot, and the characters themselves, while not terribly composed, aren't interesting enough to carry my interest. Kaladin, with his healer-turned-warrior storyline, just kept reminding me of Jack from Lost (and not in a good way), while Shallan experiences a crisis of conscience that lasts about 300 pages too long. Another character, the aging Prince Dalinar, is the typical honorable-but-naive-old-man, and Sanderson doesn't do political intrigue well enough to justify the number of pages given to his storyline. What the reader is left with is a very interesting world filled with rather dull characters. Will I be reading the second volume of The Stormlight Archive? Probably. As I said, there's hints at interesting things happening, and Sanderson is very good at painting a fascinating world of fantasy. But the first volume is a bit too long and a bit too little happens. I'll be buying the next installment in paperback; after all, with nine books to go, it's not as if the ending to the saga is going to be appearing anytime soon.